It has come to light that the 737 MAX involved in the Lion Air tragedy last year almost crashed the day before. A pilot, who happened to be hitching a ride in the cockpit, saved the aircraft from disaster by showing the crew how to regain control. Sadly, he wasn’t around the following day when it crashed into the ocean, killing all 189 people on board. 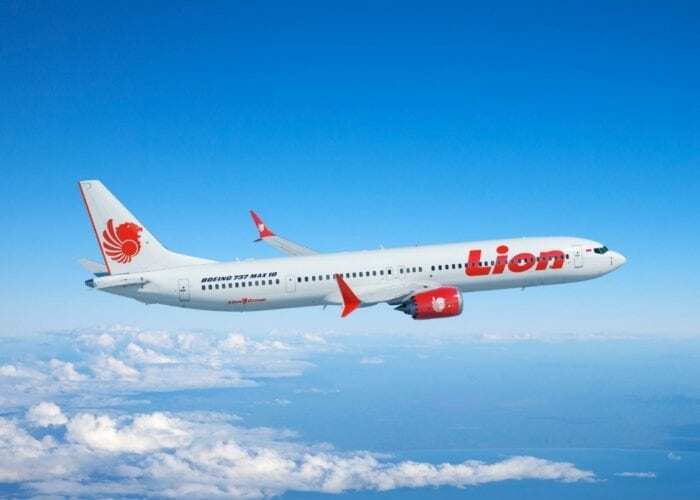 The Lion Air 737 MAX almost crashed the day before Photo: Wikimedia. The quick thinking of an off duty pilot potentially averted disaster the day before the Lion Air accident. When the angle of attack sensor caused the aircraft to trim the nose down, his ability to recommend a solution meant the plane arrived at its destination safely. However, the following day, the same fault was present. With no spare pilots in the cockpit, the Lion Air crew were flying blind, to disastrous consequence. It’s the first time details of an additional pilot in the cockpit have been revealed on the day before the crash. According to the preliminary report, airline mechanics had tried four times to fix the problem, and yet the aircraft still flew. According to a report from Bloomberg, the ‘dead head’ pilot was riding in the cockpit of the same aircraft involved in the deadly crash. He was in the jumpseat hitching a ride from Bali to Jakarta when the aircraft began to behave erratically. The flight control system was indicating a stall, pushing the aircraft’s nose down as a result. The pilot and co-pilot were unsure of what to do, but their off-duty colleague had a solution. He told them to cut power to the motor in the trim system which was responsible for driving the nose downwards. Thanks to his quick thinking, disaster was averted. Sadly, the crew neglected to pass on a report of these issues when they landed. Their maintenance request didn’t mention that they’d had a stall warning since 400 feet after take-off, or that they blamed a faulty angle of attack sensor for the issue. When the plane took off the following day, the sensor was still giving false readings. Fatally, the pilot and co-pilot on that day had no knowledge of how to rectify the problem. This is the first time that the presence of a third pilot in the cockpit has been disclosed. It could go some way to explaining how some 737 MAX pilots have coped with the fault, while others have lost control. According to those in the know, cutting the power to the trim motor is part of a checklist that all 737 MAX pilots are supposed to memorize. Clearly the pilot and co-pilot on October 29th hadn’t done that, and information from Reuters suggests they were frantically scouring the manual for a fix in the minutes before the crash. In addition to this, there is a chance that if the crew of the flight on the previous day had reported the issue they had with the MAX, perhaps the aircraft wouldn’t have flown at all. At worst, the pilot and co-pilot may have had time to research the fault and therefore been somewhat more prepared for the incident. The final piece of the puzzle is the aircraft itself. If the 737 MAX hadn’t had this fault, none of this would have mattered at all. Were it an isolated incident, the blame could have been laid at the feet of the airline, perhaps due to poor maintenance procedures or similar. But with the Ethiopian crash increasingly pointing to the very same fault, Boeing have some tough questions to answer. So, does the blame lie with the pilots, the airline, the manufacturer or the previous day’s crew? That’s a question that investigators only will be able to answer. Even if this new system’s fault is to be blamed I think banning all 737 max from flying is not correct, at least in companies with properly trained pilots. Allow me to doubt this could happen in an American, Western European, Argentinian or South African companies where 737 pilots (max included) know from the beginning how to deal with a runaway stabilizer situation. As a retired Captain I am sure this would never happened in my Company. Sorry for Asians, but it’s their fault. Well Sir, then why has the US of A grounded at 737Max planes, as has also been done by most European countries? Leaked information coming out of FAA is the Boeing often roughshod over issues highlighted by many officials at lower levels.